After many requests, we have new corrugated boxes that are more durable and slightly increased in size to allow for larger “wow” items like deflated soccer balls, dolls, and stuffed animals to travel to children in need. 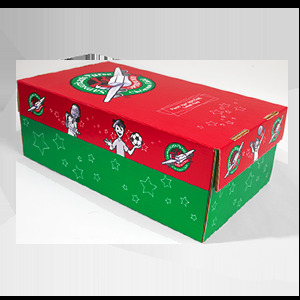 Available in packs of 50, these boxes arrive flat and easily fold into shoeboxes to pack full of gifts. When folded, the interior dimensions of these shoeboxes are 11 1/2 x 7 x 4 3/8 inches. Note: Due to the size of this item, we can only ship to a street address—no post office boxes please. Please allow one to two weeks for delivery. Shoeboxes ordered after October 26 may not arrive in time for National Collection Week. Don't forget, you can always use standard-size shoeboxes from your own closet as well.